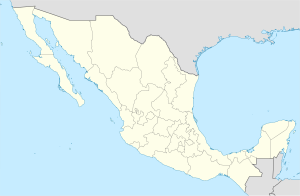 Ojinaga Municipality (formally: Manuel Ojinaga ) is one of the 67 municipalities of Chihuahua, in northern Mexico. The municipal seat lies at Ojinaga, a rural bordertown on the U.S.-Mexico border. The municipality has an area of 9,500.50 km² (3,668.16 sq mi). Ojinaga, named after Juarista governor Manuel Ojinaga, reported a 2010 census population of 22,744 people in the town, which serves as municipal seat of the municipality of 26,304 inhabitants. The municipality includes numerous very small outlying communities, the largest of which are El Oasis and Nueva Holanda. ^ a b "Ojinaga". Catálogo de Localidades. Secretaría de Desarrollo Social (SEDESOL). Retrieved 23 April 2014.